The day we've been waiting for has arrived! 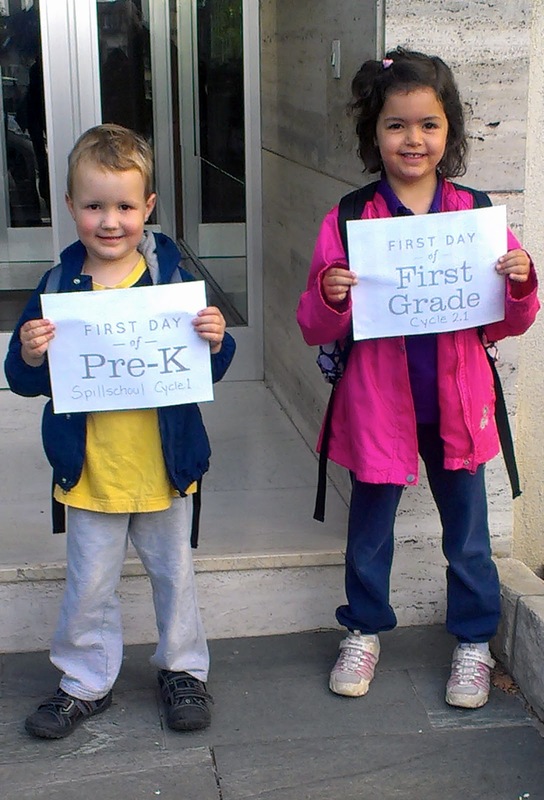 Although the kids already had a "first day of school" in Luxembourg when they began their 6-week stint this past June/July, we always thought of that as practice for the "real thing" this fall. Still, today we were so grateful for that little bit of practice time under all our respective belts (or..er...sweatpants, as you can see). And, today was an extra special first day of school because Grammy and Grandpa were here to be part of it. I don't have any pictures of them in this post, but I'll have lots in subsequent posts. It was just great to have them here today and I'm sure that it will always be a highlight in our memories. 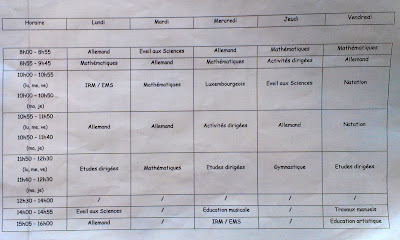 As I say, even though the kids have been to school in Luxembourg before, we hadn't had a real back-to-school day until now, and many aspects of the whole system are completely unknown to us. There was no orientation night, no list of school supplies to buy. Our only communication was a paper that came in the mail about a week ago from the Ministry of Education telling us the names of the kids' teachers and to show up at the buildings at 9am on the 17th. 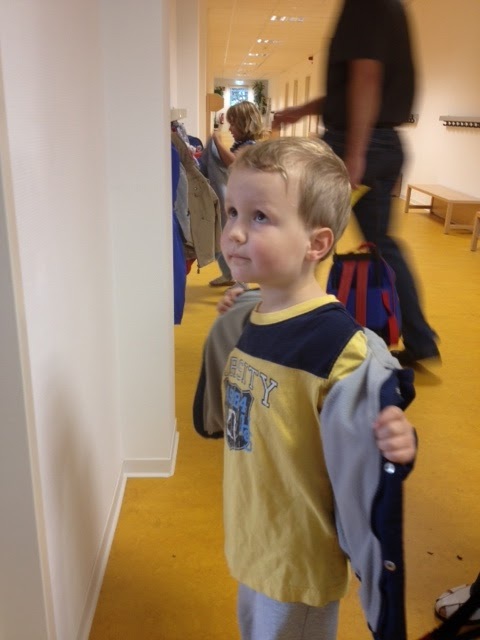 Daphne has moved to the primary school for the start of "Cycle 2," which is next door to the pre-primary building. All the kids and parents gathered in the courtyard until the school bell rang and then we all filed into the building. We didn't know our way around the building, but fortunately we'd run into a mom we knew and she told us about where Daphne's class might be. A few kids and parents were carrying big shopping bags of school supplies, which we found out meant they had the same teacher last year who gave them a supply list before the summer. It is common here for teachers to keep their classes two years in a row. We found the classroom easily. 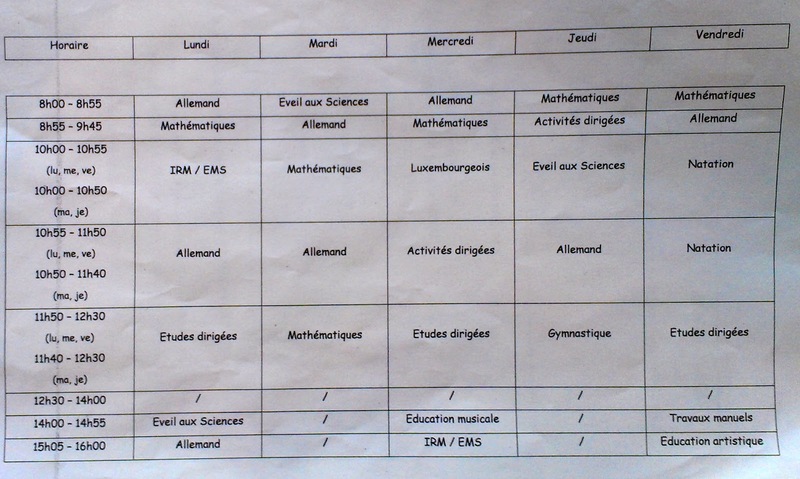 The teacher greeted us at the door and handed us a information packet in French. Daphne found a desk in the front and began to color, and was soon joined by two girls she recognized from her class last year. They all seemed happy to see one another. 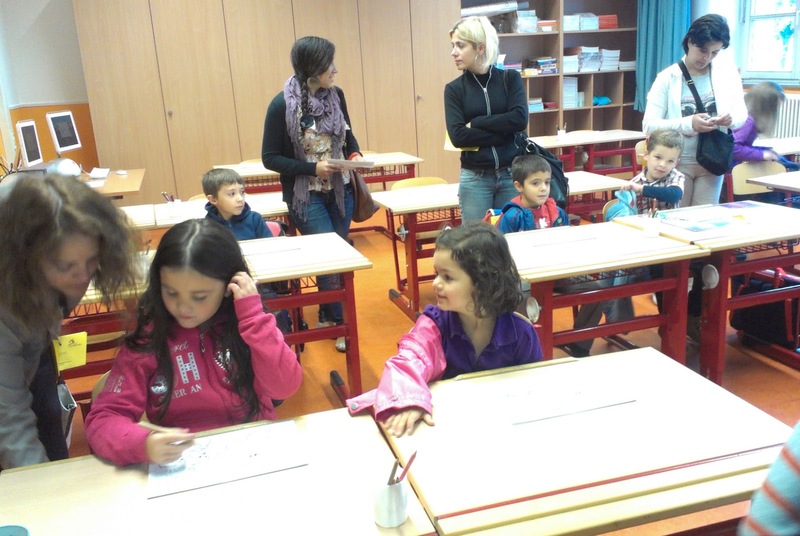 The teacher then began addressing all the parents in French, with a few breaks to speak to the kids in Luxembourgish. 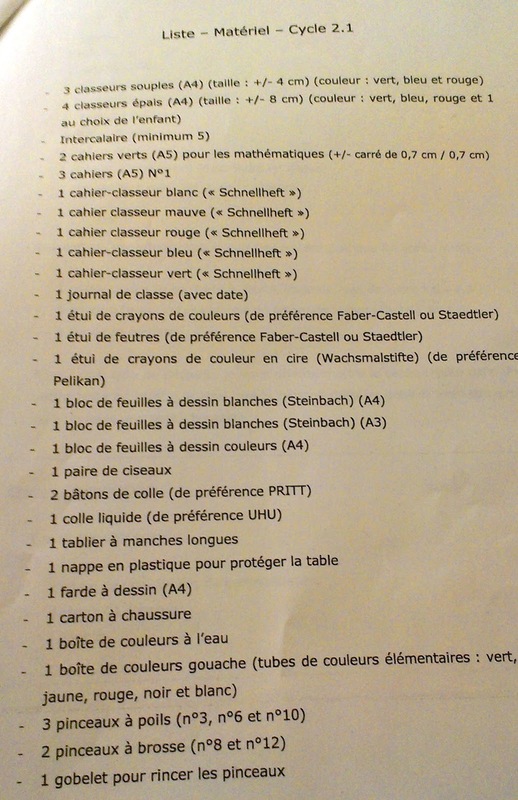 I caught very small snippets of the French content (mostly some details about he supply list in the packet) but as the parents were leaving a few of us stayed back to talk to the teacher. When it was my turn, I just briefly told her that Daphne just started school here in June and doesn't really know any Luxembourgish. She seemed like a very pleasant lady and of course spoke good English. After we all dropped off Daphne at her class, I stayed in her room for the rest of the French instructions while Pete and his parents took James over to the other building. Although he's in a temporary building which they call a "container," it's really more of a standard building than a "portable" or "modular" school building we're accustomed to in the States. It's right next to the old building they'll be tearing down and eventually rebuilding. 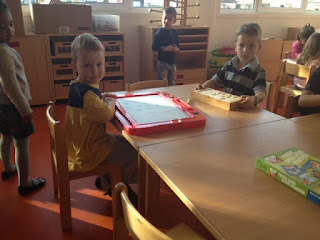 He also has the same teacher as last year, who we all liked a lot. When we picked them up at 4pm they seemed quite happy, and especially happy to see each other. They said they had spaghetti and salad for lunch (and I'm inclined to believe them based on the state of James' clothes). 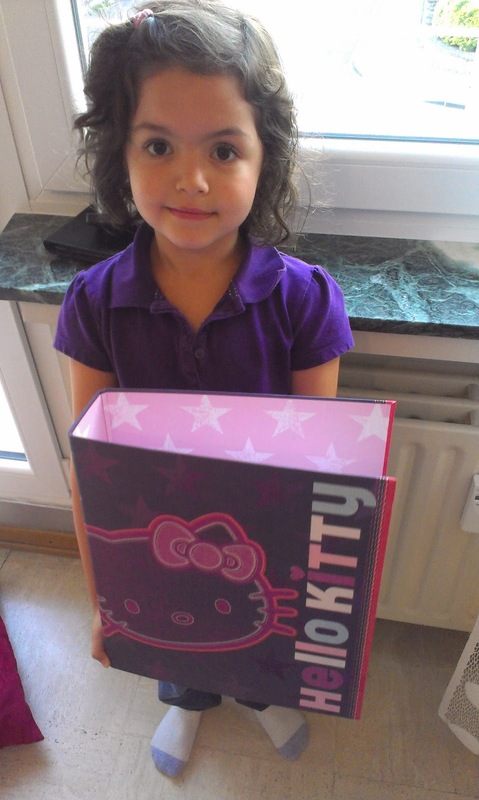 Daphne said the teacher explained a few key things to her in English (like how to win prizes?) and that she was very nice. We're calling day one a success! 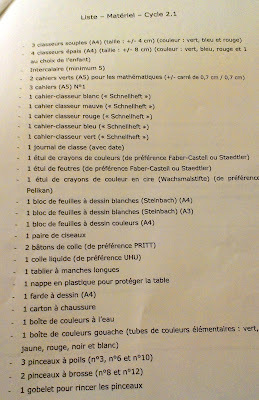 One more tidbit: Daphne's info packet contained a detailed list of required supplies, down to exact colors, sizes and brands (yes, just like the ones all parents complain about in the US. But in French). James just got a bill for supplies already bought for him by the teachers. This task would be arduous and probably next to impossible for us, except for the fact that we'd read that if you just take the list to a local book shop they will find everything for you. This was confirmed today by the mom we knew, so we headed into the city while the kids were in school and picked up nearly everything on the list. She apparently needs 4 of these HUGE binders. They must work 'em hard! So, anyway, one day down. We're still bracing ourselves for a tough few months ahead, but we're off to an optimistic start.